Forgiveness is something that I really struggle with. And when I say struggle, I mean STRUGGLE. I am a queen of holding grudges and not letting stuff go. I could give you a wrap sheet of people who I have cut off and cut out of my life for hurting me or doing me wrong. That list includes colleagues, friends and even family. (No, I don’t discriminate) And I’m the type that will cut you off and never speak to you again in life. The type that will see you in the street, at the store, or at your mama’s house and won’t speak. The type that would keep riding if I saw your car broke down on the side of the road. Okay, maybe I’m not that bad, but you get my point. My struggle with forgiveness is so real. But God has really been working with me on this issue lately and forcing me to face my issues with forgiveness head on. I’ve been seeing that my issues with forgiveness come from the fact that I heavily value justice. I hate when things aren’t even and fair. I feel like if you do something wrong then you should make it right. If you hurt someone, then you should do everything in your power to make it up to them. It’s a standard that I hold myself and others to, and it’s that way of thinking that’s made it so easy to hold grudges and bitterness in my heart against others. Whenever people have wronged me in the past my automatic response has been, “They did something to hurt me, so if they want my forgiveness then they should come to me and make it up to me by apologizing. That’s only me being fair.” I felt that if I forgive them without them taking the steps to make it “right”, then I was letting them off the hook. I thought that if I didn’t hold a grudge then what they did had no consequences. While it may sound fair and even sound right on the surface, the way I was thinking, and the way many of us think about forgiveness, isn’t based on truth. I think what’s at the core of our unforgiveness is the lie that our healing has to come from the same place that our hurt came from. We feel that since a particular person was responsible for hurting us, then by default, they are responsible for healing us. We hold on tightly to anger and pain from past hurts because we falsely believe that the people who hurt us are the only ones capable of setting us free. Forgiveness frees us from that way of thinking. It allows us to realize that even though someone hurt us, we don’t have to wait around for them to heal us. We don’t have to walk around day after day holding onto grudges, waiting around for an apology that may or may not ever come. 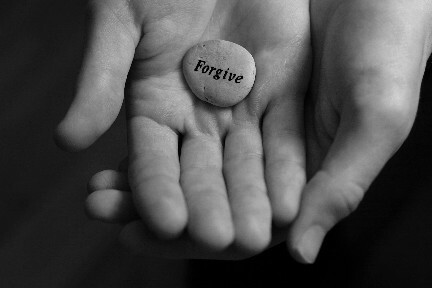 Forgiveness allows us to see that our healing is not dependent on the person that hurt us. It opens our eyes to the fact that it doesn’t matter where our hurt came from because our healing ultimately comes through Christ. That’s what makes forgiveness so freeing. It turns our attention away from the ones who hurts us, and sets our eyes on the One who heals us. He is the only One capable of tending to the wounds from our past. He is the only One that can take the sting out of the slights we’ve felt. He is the only One who can piece our heart back together after it’s been broken by others. And realizing that forgiveness hinges on Him and not on human beings, reminds me of why Christ died on the cross for us. His death was the ultimate act of forgiveness. It was the recognition that no human being would ever be capable of apologizing, sacrificing or paying God back enough to cover the wrongs of our sins. It was the ultimate recognition that there was no way a human being could heal the agonizing hurt we cause God whenever we disobey Him through our sin. Christ’s death was the realization that human beings were incapable of undoing the damage our sinful ways cause. I hurt the very heart of God every single time I sin. We hurt the very heart of God every single time we sin. Every single time. Yet He doesn’t hold grudges until I make it “right”. He doesn’t make me, or any of us, pay Him back for wronging Him. He forgave each of us and tangibly showed us that forgiveness by sending His only begotten Son. Looking at His incredible forgiveness of all of my sins, makes my unforgiveness seem really petty, childish, trivial, insignificant…well you get the point. So maybe you’re like me and struggle with forgiveness. Maybe you’ve been holding grudges with the false hope that the people that hurt you were the only ones capable of healing you. Maybe somewhere along the way you forgot that the same forgiveness God extended to us over 2000 years ago on an old, rugged cross is the same forgiveness we’re called to extend to others. But as you go into the new year, start off by taking your eyes off of the ones that hurt you and fix them on the only One who has ever been capable of healing you. Go into this new year letting go of pain and bitterness that unforgiveness causes, so you’ll be able to fully embrace the healing and comfort that God’s forgiveness brings. Pick up that phone, send that text, write that e-mail or letter (Shoutout to you if you still write letters) and let someone who hurt you know that you forgive them because you know the One who has forgiven you.